Support level is formed by the lows of two or more candlestick bars that form a rather straight horizontal line with no lower lows between them. Resistance level is formed by the highs of two or more candlestick bars that form a rather straight horizontal line with no higher highs between them. Consolidation is a period without any trend, forming near support or resistance level, with the relatively small candlestick bodies. A close below the support level signals a short position. A close above the resistance level signals a long position. Stop-loss is set to the low of the previous candlestick (for the long positions) or to the high of the previous candlestick (for the short positions). 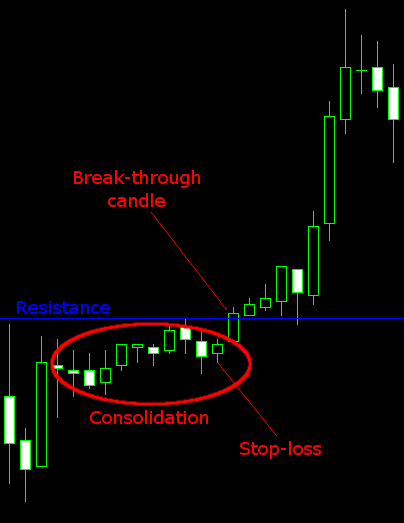 Take-profit can be set relatively to the stop-loss or as a trailing stop of some sort.